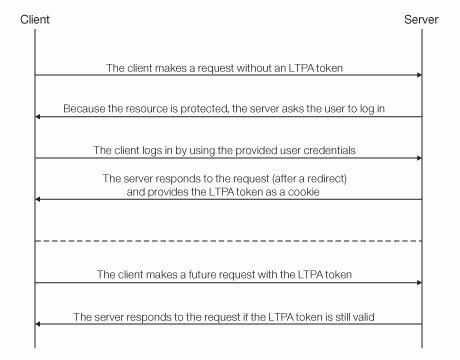 A lightweight third-party authentication (LTPA) token is a type of security token that is used by IBM WebSphere Application Server and other IBM products. LTPA can be used to send the credentials of an authenticated user to back-end services. It can also be used as a single sign-on (SSO) token between the user and multiple servers. After a user logs in to the server, the server generates an LTPA token, which is an encrypted hash that contains authenticated user information. The token is signed by a private key that is shared among all the servers that want to decode it. The token is usually in cookie form for HTTP services. By sending the token as a cookie, the need for subsequent user interaction is avoided. LTPA tokens have a configurable expiration time to reduce the possibility of session hijacking. Your infrastructure can also use the LTPA token to communicate with a back-end server that acts on behalf of the user. In a reverse-proxy topology, the user cannot directly access the back-end server. 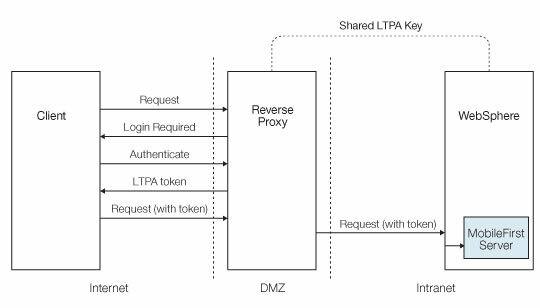 The reverse proxy can be used to authenticate a user’s identity, and then send the LTPA token of the authenticated user to back-end servers. This configuration ensures that access to MobileFirst Server cannot be obtained until a user is authenticated. This is useful, for example, when you do not want to use Mobile Foundation to handle vital user credentials, or when you want to use an existing authentication setup. Enterprise environments should use a reverse proxy, such as IBM WebSphere DataPower or IBM Security Access Manager, in the DMZ, and place the MobileFirst Server in the intranet. In a reverse-proxy implementation, MobileFirst Server must be configured for LTPA authentication to get the user identity. You can use a reverse proxy to enable enterprise connectivity within a MobileFirst environment, and to provide authentication services to Mobile Foundation. Reverse proxies typically front MobileFirst Server instances as part of the deployment, as shown in the figure below, and follow the gateway pattern. The MFP icon represents an instance of MobileFirst Server. The GW icon represents a reverse-proxy gateway, such as WebSphere DataPower. In addition to protecting MobileFirst resources from the Internet, the reverse proxy provides termination of HTTPS (SSL) connections and authentication. The reverse proxy can also act as a policy enforcement point (PEP). When a gateway is used, an application (A) on a device (D) uses the public URI that is advertised by the gateway instead of the internal MobileFirst Server URI. The public URI can be exposed as a setting within the application, or can be built in during promotion of the application to production, before the application is published to public or private application stores. If authentication ends at the gateway, Mobile Foundation can be informed of the authenticated user by a shared context, such as a custom HTTP header or a cookie. By using the extensible authentication framework, you can configure Mobile Foundation to use the user identity from one of these mechanisms, and establish a successful log in. The below figure shows a typical authentication flow for this gateway topology. This configuration was successfully tested with WebSphere DataPower for LTPA-based authentication. 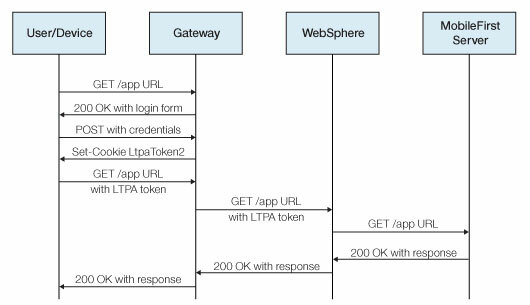 On successful authentication, the gateway forwards an LTPA token (in the form of an HTTP cookie) to WebSphere Application Server, which validates the LTPA token and creates a caller principal. Mobile Foundation can use this caller principal, as needed. The predefined MobileFirst LTPA-based single-sign on (SSO) security check (LtpaBasedSSO) enables integration of Mobile Foundation with the WebSphere Application Server LTPA protocol. This security check allows you to integrate instances of MobileFirst Server within an LTPA-based gateway topology, as described in the previous sections, and use a back-end service to authenticate users by using an SSO LTPA token. This predefined security check can be used as any other security check in the MobileFirst security framework you can map a custom scope element to this check, and use the check (or a scope element that contains it) in a protecting resource scope or in a mandatory application scope. You can also configure the behavior of this security check for your application. The predefined LTPA-based single sign-on (SSO) security check (LtpaBasedSSO) has a single configurable property: expirationSec. This property sets the expiration period for a successful security-check state. The expiration period determines the minimal interval for invoking the check again after a successful execution. Note: The procedure explains how to use the MobileFirst Operations Console to configure the property value. Alternatively, you can also set the property value directly in the application-descriptor file. For detailed information, see Configuring application security-check properties. Open a MobileFirst Operations Console window. Select your application version from the navigation sidebar, and then select the Security tab. In the Security-Check Configurations section, click on New. In the Security Check field, select LtpaBasedSSO from the list. In the Expiration Period Successful State (seconds) field, set your preferred expiration period for a successful state of the security check, in seconds. When the configuration is done, you can see and edit your LtpaBasedSSO security-check configuration in the Security-Check Configurations table of the application Security tab.